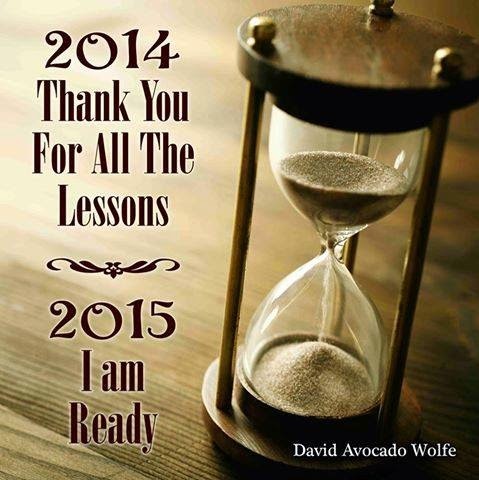 WooHoo we have arrived at 2015. I love the New Year as I feel it is a time to start over with a clean slate. New Years Eve, I always make a deal with myself that all that happened the past 12 months is finished, completed, done and dusted. If I succeeded in something I congratulate myself, if I didn't I put it down to experience and try to learn from it. I try to work out why I didn’t succeed, was NOT succeeding part of my learning? Then on New Years Day (or maybe the 2nd depending how big my NYE was!) I sit quietly and make my goals for the New Year. I stopped making New Years Resolutions a long time ago, as I proved to myself, for me they don’t work. Over the past few months I have learned and proven to myself that if I set a goal for no longer than 30 Days I usually succeed. They (whoever they are!) say that if you do something for 3 weeks (21 days) consistently that action will become a habit. I have also realized that some months, I just don’t want to face a challenge for the whole month so they are the months where I break my challenges into weeks. These are not usually life changing habits just something I would like to do for a week. That’s purely why I started the 30 Day Challenge group on Facebook. Yes, it was purely selfish, so I could make progress in my life with things I was finding I was getting stuck on. I also came to the awareness that if I put my intention out there in the world and I was accountable to another person I had to succeed or at least make a huge effort at my challenge. So, one of my 2015 goals is to bring my 30 Day Challenge world to my blog. It won’t consume my blog totally as 2015 will also consist of more travel around Australia and hopefully lots of other exciting events, adventures and moments in my life. But if you would like to accomplish something in your life you are most welcome to join me on my journey. Who knows what you might succeed at during 2015? Seeing it’s the start of a whole New Year I thought I would start the year off nice and gently. So with that in mind I have broken down January into weekly challenges. Each Friday I will post your weekly challenge which you can participate in. You can make your personal challenge as simple or as complex as you like. It doesn’t matter if you don’t succeed at something as long as you give it a go. You can set yourself one goal for the week or as many as you like. But keep in my mind make your challenge something that is achievable. January is YOUR month. The first month of 2015 is time for you to look after YOU. Of course if there is something you want or need to do for someone else by all means do it. But predominately it is YOUR month. If you are interested in joining us on our January journey check back in on my blog on Friday 2nd and you will be set your first weeks challenge. I would really love to have you along for the ride.